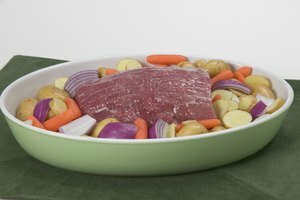 A steamship round is a beef roast that consists of a whole round with a rump and a heel. 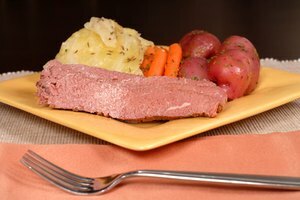 The cut is traditionally used as a cut of roast beef at a buffet. At home, you can add your favorite vegetables to the round for a side dish at the end of the cooking process. Cooking a steamship round will require a large roasting pan and several hours. The round typically weighs 50 to 60 pounds. Preheat the oven to 300 degrees Fahrenheit. Take the meat out of the package and then place it into a roasting pan. Rub the meat with salt and pepper on all sides. Fill the pan to 1-inch with water. Put in white onions, peeled garlic, celery, carrots and potatoes around the meat. 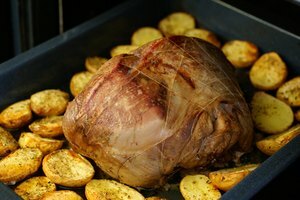 Cover the meat with tinfoil or a fitted lid and then place it in the oven. Cook a 50 to 60-pound round for four to five hours. 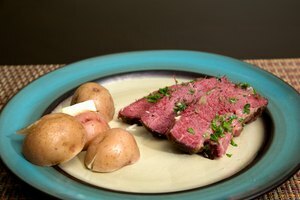 Insert a meat thermometer into the center of the round and let the temperature reach 140 degrees Fahrenheit before removing the roast from the oven. Let the meat sit for 10 to 15 minutes before slicing.